In India, autism is still widely misunderstood and, outside of the large cities, often undiagnosed. This article is the first in a bimonthly series that will address early child development. Today is World Autism Day. People around the world will be marking the day by wearing blue, lighting their buildings blue and hosting a wide range of activities to spread the word, create awareness, share knowledge and build a sense of urgency about the alarming rise in incidence of autism and the importance of identifying it early. Thirty years ago, autism was little-known and considered a rare disorder, the result of poor parenting and blamed mainly on so-called “refrigerator mothers”: those blamed for not providing enough “maternal warmth. By 2006, with one in 166 children being diagnosed with the condition, such unscientific thinking could no longer be supported. The world was beginning to take note. Today, it is known that one in 68 people have autism. The condition is more common in boys than in girls: one in 42 v. one in 189. Just better diagnostic skills don’t quite explain why we are seeing more cases each decade. In India, autism is still widely misunderstood and, outside of the large cities, often undiagnosed. Some doctors even claim that autism is a Western disorder and that few Indian children actually have it. There is no scientific evidence to support this. Vaccines have been widely blamed as causing autism. However, Andrew Wakefield, the British doctor who first promoted the idea, has been discredited, his article in The Lancet retracted and his licence to practice medicine revoked by the British Medical Council. In an essay published by the College of Physicians of Philadelphia, the story of Wakefield’s fraudulent research is told in detail, including how many panicked parents in the UK sadly refused to vaccinate their children at all. Though the trend has since subsided, there are still significant numbers of people who continue to believe that vaccines may cause autism. Autism is a complex neurodevelopmental disorder. Commonly, people with autism have difficulty with social interactions and relationships, and trouble expressing themselves appropriately – verbally as well as non-verbally. Most people with autism engage in repetitive behaviours (like flapping their hands, rocking or obsessively focussing on one particular activity). But far from being just a manifestation of a disability, these behaviours are actually thought to be coping mechanisms. Children and adults who engage in them are actively trying to cope with a world in which they feel assaulted by a barrage of sights, sounds and sensations their brains are not equipped to deal with. Many in the autism community believe that forcing children to give up self-stimulating behaviours could actually be harmful. They advocate ‘neurodiversity’ and accepting people as they are. 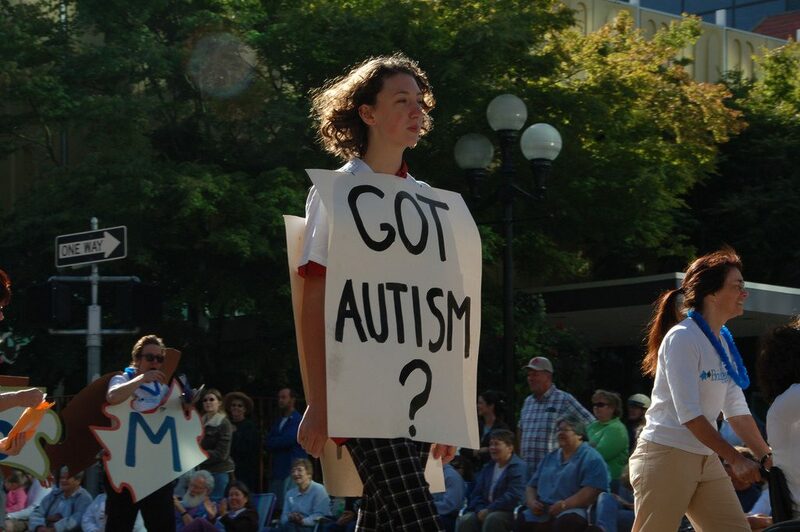 Autism is called a spectrum disorder because there is a wide range of ways in which it appears. Some people may be so mildly affected that they can hold a regular job, have normal relationships and – with small adaptations – seem just like anyone else. Others with more severe manifestations may be unable to speak, live on their own or manage their own needs by themselves. All over India today, disability centres, homes and institutions will ‘Light Up Blue’. Last year, iconic sites like the Niagara Falls, the pyramids of Giza, Mumbai’s Chhatrapati Shivaji Terminus and Delhi’s Qutab Minar went blue. Schoolchildren and parents wore blue t-shirts and participated in rallies and flash dances. But a day to create awareness is only useful if we take the knowledge part of it seriously. According to Dr Sally Rogers of the Medical Investigation of Neurodevelopmental Disorders (MIND) Institute, University of California, Davis, early intervention is an important and predictive factor in mitigating the symptoms of autism, or any disability for that matter. In a review of six studies on the impact of early interventions (EIs) published in 1996, Dr Rogers found that in each study, children who received appropriate therapy had improved outcomes within two years. Autism can now be diagnosed reliably in children as young as two, sometimes even younger. But most children are not diagnosed until five. In India, that age is even later because of a lack of awareness, stigma and denial. Good and early interventions can change the course of a child’s life. So it is vital that parents be aware of the signs and seek help the moment they have concerns. Those signs fall roughly in three categories: communication, social interactions and behaviours and interests. If they are honest, parents would almost always have noticed that their child is different from others, often long before they seek help. The onset of speech might have been delayed or she would have stopped saying words she was known to have been using earlier. She wouldn’t have been making eye contact or trying to get her caregiver’s attention. Some children have also been known take another person’s hand to use to open a jar or reach something too high, simply unaware that the hand is attached to a real person. One of the biggest problems for families in India is finding reliable professionals who can help them help their children. Quacks abound and there is no shortage of people ready to profit from the troubles of others. Nayi Disha, a Hyderabad-based organisation, has been trying to address this gap through the creation of a free, online information resource to help parents find certified centres and professionals and them with parent networks around India. In Western countries, according to a 2014 article published in the journal JAMA Pediatrics, the lifetime cost of caring for a person with autism was estimated to be as high as $2.4 million. Even adjusting for inter-currency conversion rates, the fact remains that disability is expensive for the country. It is not only the direct care of the individual but also the loss of productivity of the person caring for her that counts. Since early intervention can make such a difference in the disabling aspects of the condition, everyone needs to learn as much as possible about autism and stay aware of the specific red flags in children they may know. My daughter-in-law Lydia came up with the slogan “1 in 68! Act now! Why wait?” – it captures the urgency and the positive, proactive approach India needs to take to adequately respond to what can only be seen as a crisis in child development. This article was originally written and published on The Wire. Good article! We are in the field of mental disability since 1993 and mainly the problem we come across is late diagnosis & obviously denial which results in very late intervention. We at Nagpur are facing the challenge of not having paedeatricians trained for early diagnosis. There is no special diagnostic tool to have differential diagnosis for mentally challenged and autistics and most of them are simply labelled as mentally challenged. I wish if we can have a developmental therapist we can start a early intervention centre at Nagpur. If some one can help us. Navin, we all wish the same thing. You need to get out and about. Attend conferences. Write articles on the importance of early identification for your local newspapers. Lobby the government. Meet people in the field. Find a pediatrician willing to come to Nagpur and do some voluntary screening and assessments. Get her/him to train your local doctors. There are so many things you can do to change the story in Nagpur. Good luck and keep me posted on how you do!